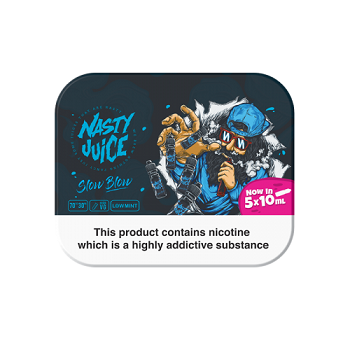 Slow Blow pineapple & lemonade flavoured e liquid by Nasty Juice. 50ml. Nasty Juice Slow Blow has been crafted in a way that delivers a perfect balance of flavours in one bottle. A heavenly blend of fresh pineapple showered in a lime soda down pour that will propel your taste buds to another level. This e-liquid is the embodiment of perfection by coupling the delicious mouth watering pineapple taste, countered but enhanced by the bitterness of the lime soda that will create a true flavour explosion on your tongue that descends downwards and then back out into a lovely thick dense cloud, leaving you happy and satisfied. As this is a Superior Vape Juice... I am giving it 5/5 or 10/10 I rate it that high...I cannot wait to try the next flavour.....its taste is exquisite and so mellow....Try it i'm glad I did.